Last week, I took a much-needed break and headed to Point Clear for a family vacation. I ate bad, didn’t exercise, read 5 books and I LOVED every single minute of it. By the time this dreaded Monday morning rolled around, I was surprisingly ready to get back on track with eating right and hitting the box. Oh and did I mention that school started today? Yes, I work full-time and attend Troy University and let’s not forget I’m also a wife and mother. I’m finally a junior/senior and my expected date of graduation is December 2013. Thankfully, my classes are online so I can still get my CrossFit on after work. Today was an interesting night at the box. RRCF often celebrates birthdays of CrossFitters at the box. Today happens to be Kelli’s birthday. I am always nervous before I hit the box and my work out partner, Steph is usually nervous too. Welllll, tonight Steph walked in wired on Spark. Hence, her new nickname – Sparky. Sparky was dropping it like it’s hot during our squats and barking during the lunges. Needless to say, I had lots of fun tonight. I have determined every night needs to be a spark night. Thanks for all the laughs tonight, Sparky. Last night’s WOD was prefaced with a 20 minute skill session: Hand Stand Push Ups (HSPU) and Double Unders. Let me just tell you that I’m afraid of HSPU’s and it isn’t because of the difficulty, but because I’m upside down. When I was a kid, I felt no fear except for haunted houses and rollercoasters. I rode bikes with no hands, tried rollerblading down a small hill (my best friend, Emily, had to slow me down because I was headed for a crash), riding a skateboard down hills (of course, while sitting on the skateboard), but now that I am older I can process and UNDERSTAND what happens when you fall on your head, etc. Josh understood my panic and set me up with my own safety harness, which consisted of two of the green bands connected to the pull up bar. He demonstrated for me, but that still didn’t soothe my fear. I tried it, with Josh’s assistance, and got the initial “freaking out” behind me, but I was still scared. I attempted to “donkey kick” up without my harness and failed, but Josh assisted me once more to an actual handstand. I was able to hold it in that position, but not for long. I am unsure of what it will take to soothe my fear with HSPUs, but I’m going to try. 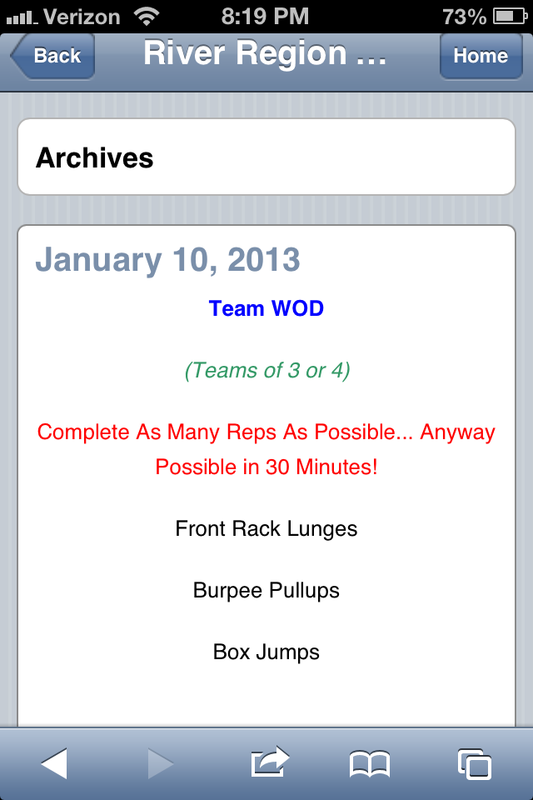 The WOD was killer, again. Surprised? Well, you shouldn’t be. Even the “smallest” of WODs will surprise you! I believe our entire 6:30 class (all women) were grunting to power that Kettle Bell. I know this seems easy, but it’s 5 Power Cleans and 20 Lunges, 4 Power Cleans and 20 Lunges, and so on…for a grand total of 30 Power Cleans and 200 Lunges.